Our Startravel 80 tabletop 80mm (3.1") f/5 refractor telescope is perfect for newcomers to astronomy, or those wishing to combine portability with good optical performance. The compact Sky-Watcher STARTRAVEL series are two-element, air-spaced, multi-coated objective, achromatic refractors, and are well proven performers for 'Rich-Field' views of star fields, clusters, nebulae, bright galaxies, planets and the Moon, as well as giving excellent terrestrial views. 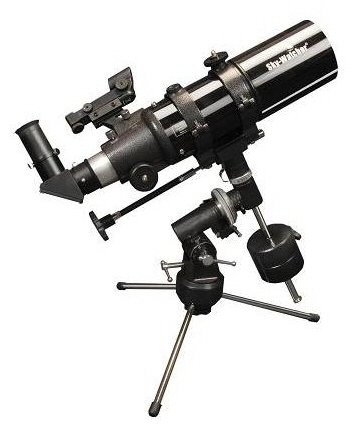 These wide-field, short-tube telescopes are also highly portable. All models also excel as fixed aperture lenses for both Astrophotography and terrestrial photography. Our Startravel 80 tabletop telescope is manufactured by Sky-Watcher, one of the most respected telescope manufacturers - products you can trust, representing great value for money. Supplied with carry bag.